ECO TRAILS KERALA : an Independent Travel Service Provider functioning as a part of Tharavadu Heritage Home at Kumarakom, providing personalised assistance & services to Tourists for making their Itinerary & Tour plan in Kerala. We also provide Budget Holiday Tour packages by connecting Houseboat Cruise & alternative places to stay in Kumarakom & Alleppey Backwater areas in Kerala India. Welcome to the unique land of wonderful experience..Kerala! 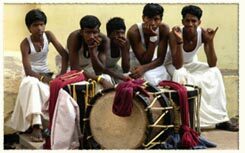 If you would like to enjoy Travel to Kerala to see the fascinating state in South India, or to experience the Heritage Resorts, Backwaters, Houseboats and Cultural attractions of "God's own country", we can help you plan your tour. Eco Tours Kerala presents enchanting Kerala Travel in the form of various tour packages. We specialize in Kerala Travel by providing tailor made packages for Kerala and the same could be modified to meet any of your specific requirements & interest. 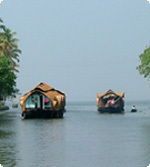 Kerala is rightly referred to as the land of Coconut, a land of Rivers, Ayurveda, Houseboats and Backwaters. The Kerala Travel and holiday packages offered by Eco Tours Kerala assures that it will cover all the significant venues from places replete with natural bounties to locations with historical significance. Ecotourism is defined as "responsible travel to natural areas that conserves the environment and improves the well-being of local people". Ecotourism has become popular among tourists interested in environmental conservation and sustainable development. It is a way to save forests and a "win-win development strategy for undeveloped rural areas”. Principles of eco-tourism advises to minimize impact, build environmental and cultural awareness and respect, provide positive experiences for both visitors and hosts, provide financial benefits and empowerment for conservation and local people, raise sensitivity to host countries' political, environmental, and social climate as well as to support international human rights and labour agreements.